The Cortec EcoAir VpCI-414 is a water-based, biodegradable cleaner. It clings to ceilings and vertical surfaces in hard to reach areas. 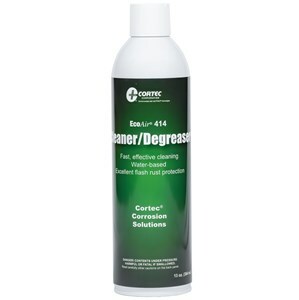 Quickly removes dirt and grease on numerous metals while preventing further corrosion. Biodegradable and solvent free. Multimetal protection. Nonflammable, extinguises fire! 13 oz.